There’s this one keyboard in my house that is just nasty. I mean, the years of food, drink, greasy fingers, and not being cleaned didn’t do anything to helps its cause. It’s pretty much beyond cleaning at this point, unless you were to take out each key, individually clean it, then reassemble it. At that point, I think we can all agree it’s time for a new one. Maybe, just maybe, I’ll pick up the Washable Keyboard from Unotron. It won’t quite clean itself, but it makes it easier for you to do it yourself. A human-sized android was paraded in a public demonstration in the middle of last week in Tokyo, and it was proudly showing off its weightlifting skills to everybody by picking up a 30kg package from a desk as well as lifting a 66kg humanoid doll out of bed. I suppose this droid would definitely be a boon to nurses and healthcare providers worldwide, since plenty of patients these days are from the obese and overweight categories, leaving nurses no choice but to call for help when transporting these patients out of bed. When you talk about cardiac monitoring devices, most of the time the image that comes into mind is some bulky piece of electronics. 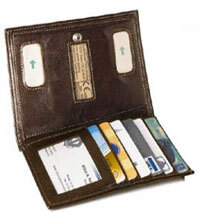 The CardioPocket aims to change that image by offering a leather wallet that can be used to carry bills, credit cards, ID, and other wallet-y items, doubling up as a 1-lead ECG transmitter which can be used to diagnose heart rhythm disturbances. The ECG transmitter within will be able to encourage the subscriber to pick up the phone and contact the Monitor Center pronto whenever any discomfort arises. All the user needs to do is place the wallet against the chest while using a cellphone or standard telephone to transmit a real-time ECG strip within seconds for an immediate consultation. Dragon I, Is That an iPod Dock, an Octopus or a Vase of Flowers? Take a look at this picture. Is that a modern art sculpture, an octopus, or maybe even a vase of flowers? No, that’s the Dragon I, a new sound system with an integrated iPod dock and a design that’s clever and original. 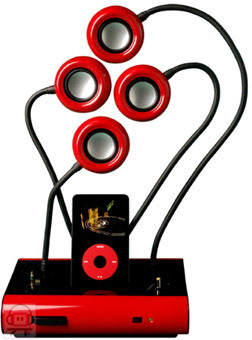 Each of the “tentacles” is actually an independent speaker with 5 watts in a total power of 20 watts. Read moreDragon I, Is That an iPod Dock, an Octopus or a Vase of Flowers? What?! Pyramids?! On a gadget blog?! Yes, here’s why. A French archaeologist Jean-Pierre Houdin teamed up with Dassault Systems (they make Solidworks, my favorite 3d modelling software) to showcase Houdin’s newest theories about how the pyramids were made. It tips a lot of the older theories of construction on their heads. Houdin’s theories are rather impressive, simple, and direct at demonstrating how the great pyramid could actually have been completed. A combination with clever pulleys, counterweights, sledges, lifts, and internal ramps that protected workers from both the sun and loose debris from outside. Check out the 3d presentation over at Dassault Systems. As we haven’t mentioned a shocking gadget in the last 24 minutes I thought it only fair to write about a shocking game for clever folk (if that’s not a contradiction in terms), the multiple choice shocking game. 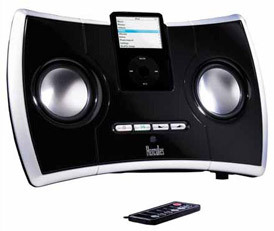 Hercules presents the I-XPS 260 2.1 speaker system with an integrated dock for your iPod and a 3D stereo effect. This system has the official “Made for iPod” license and is compatible with the 30, 60 and 80 GB iPods and comes with adapters for your iPod mini and iPod nano as well. There’s also an auxiliary input that you can use to connect another MP3 player if you want to.